← Feeling tired, wishing I had more time to paint, lost mojo! I have been quiet on the painting front lately, due to another visit to the vets with my poorly cat, and giving her lots of TLC. ……….but it is a bank holiday weekend, so I thought this is my opportunity to get out the paints again. I had started this moose towards the end of last week, (just the out line). Now we don’t have moose here in England, so I had to go by reference photos ( thank you to paint my photo website) but despite these it is hard to know the fine details/if it is accurate, due to my unfamiliarity of these cute creatures. A little different to the wild new forest ponies we have here in the new forest. 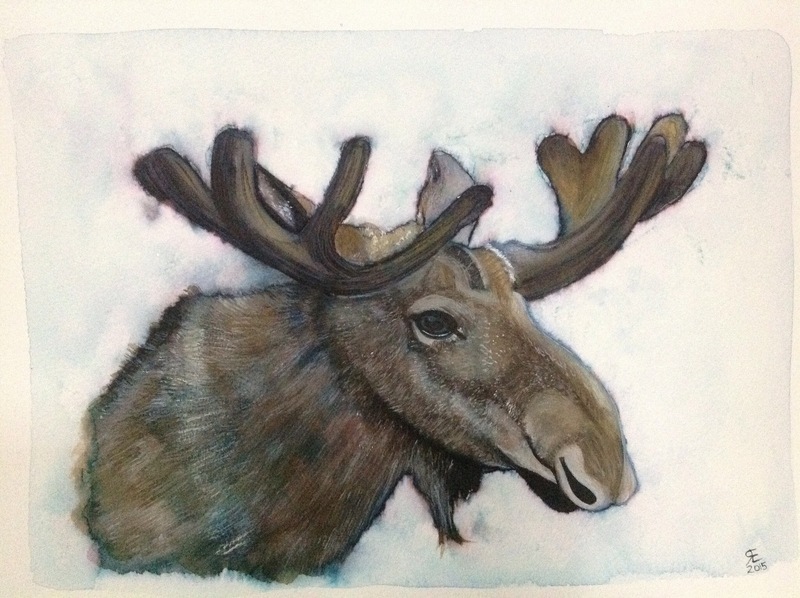 So here is my moose, one watercolour sketch, the other portrait. ( By the way, the reason for painting a moose is my late pony Mace, was often nik named the moose). 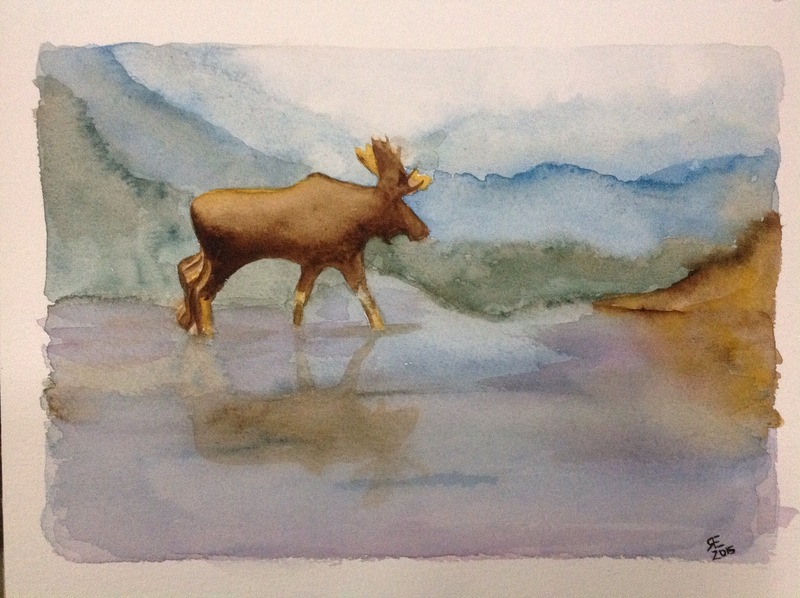 This entry was posted in art, Moose, watercolour and tagged art, moose, painting, Painting, watercolour. Bookmark the permalink. A good likeness in both cases. And best wishes to your cat’s recovery. Thank you, that’s good to know. I think my cat is at last on the correct medication, antibiotics and pancreatitis medication, it has taken a while, improvements are showing….. If only they could talk, it could help with diagnosis. What a stressful few weeks. I’ve seen a few moose in person, Rebecca, and I think you’ve done a wonderful job. These are both beautiful! I’m glad they’ve got to the right meds for your kitty. We are both with sick kitties, but mine I think has an incurable kidney problem. She doesn’t want to eat without appetite boosting drugs, which is sad. She used to be such a sassy girl! I’m glad to hear your baby is better. Our animals mean so much to us. I’m curious what they are giving yours for pancreatitis, as Penny has this also….I didn’t know they could be given drugs for this. Take care. She also has antibiotics, which they were reluctant to give initially, as they thought it was viral and not bacterial, I am not sure if one or both of the medications have helped, or if it will be ok once the course of medication has finished ( tonight). Either way she has been comfortable for five days, and I have not had to clear up poo! ( sorry for that…but the poor little mite had it uncontrollably coming out even when asleep). Thank you. Yeah, her blood levels were really high, her kidney and pancreatitis levels, but she’s had bouts of pancreatitis forever it seems. Since she was very young. The vet thought at first it was a kidney infection, and she responded seemingly well to the first few doses of antibiotic, but then lately she seems to have gone down hill. Now she won’t eat without the appetite boost and nausea drugs. And very little at that. Vet comes again Thursday at noon, may have to say goodbye to her. Makes me very sad, but as you say, don’t want to put them through more than we have to. She does drink lots of water and likes soupy cat food, but her appetite has really dropped off here in the last few days. I never knew before how common kidney disease is in cats! Wow, it’s nice you have five…..I can’t imagine being catless, but at the same time thinking about getting another one is just toooo much. Our only child graduated college May ’14, so we’ve been empty nesters for over a year…..but we always had Penny. It’s sad. Your artwork really cheered me up though! So beautiful, and particularly since you’ve never seen a moose, even better. Thank you Lance … Moose are on my huge list of things to see…..but undoubtedly will not get the opportunity, unless I see one in a zoo, or win the lottery. Painting one is as close to smelling their breath, as I shall get.